By 1931, the German army had already began their search for a new standard service pistol to replace the aging and costly P08 Parabellum, better known as the "Luger". Fritz Walther saw an opportunity for his company and immediately began working on a series of designs that would ultimately lead to the success known today as the Walther P38. Fritz Walther knew at once that only a design in 9mm Parabellum would be successful. He also decided that the design and construction of the new pistol would have to improve upon the negative factors of the P08 Luger. Those factors were: cost, reliability, and fewer parts. The first design in this series of pistols was the Walther PP. This pistol was very successful; it was a blowback action, with a double action trigger. Walther thought first that they simply needed to enlarge the dimensions of the PP in order to have a successful 9mm Parabellum design. The blowback design was the key, and was much cheaper to produce than any locking systems. The first unlocked military pistol was known as the Walther MP (militarpisole). This pistol had a very high weight, and recoil spring was difficult, and not reliable. Only about a dozen of these pistols left the factory, and only about 6 are known to still exist! Walther decided that they needed a locking system. However it needed to be simple, cheap, and still reliable. They found one developed by an American named Pederson, who developed it for the Remington pistols. Once they had this design, the weight and dimensions of the MP were changed. This oversized PP had a locking system with a rotating barrel. However all of these designs were rejected, because of the high prices, as well as weight. The Walther PPK was another design in this series which influenced the later P38. The main design feature of the PPK was its' cost savings. The PPK frame used far less materials to make it, since it did not have a back strap. The backs trap was performed by the plastic wrap around grips. This saved materials, weight, time, and cost! This would eventually be used on the P38 as well. Walthers' next design incorporated an enclosed hammer, as well as a free floating barrel (the army demanded a free floating barrel for reliability). This new pistol was known as the Walther AP (armee-pistole). This pistol had a take down lever like the P08, and also had the double action trigger system of the PP. It also had a locking system, but it differed from the MP with only having a single locking block rather than two. The AP was the building block to Walther next design - the HP, or Heeres-Pistole. Walther made a few minor changes to come up with the Walther HP. 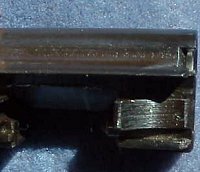 The HP had an external hammer, which the army preferred, and had a single case harden locking block, which prevented it from cracking. By late 1938 the Walther HP was in production, for commercial sales. Serial numbers ended at 1025. With a few more minor changes, the pistol finally was accepted by the German army, and "P38" became the official model name! The army initially ordered 800 pieces on April 1, 1939. Many of these pistols had mixed parts between the HP and P38 and be marked with the commercial proof. All of these were manufactured by hand! The first really genuine P38 were known as the Zero-series. These started with the serial numbers 01-013000, and below is pictured an example of one of these Zero-series P38s. These were the very first military P38s, and only 13,000 were made between April 1939 and March 1940. On April 26, 1940 official test were completed, and the army ordered 410,600 P38s. Production was very slow at first and although Walther was projected to complete 175,000 pistols by June 1940, only 9,750 were completed and delivered. Finally on April 1, 1941, Walther was able to achieve its' monthly goal of 10,000 pistols. However, Walther still needed help to meet with the armies' needs. By the end of the war 1.2 million P38s were produced, of which Walther made only about 580,000. Because the Wehrmacht needed more than 10,000 pistols per month, they looked for other manufacturers to produce the P38. 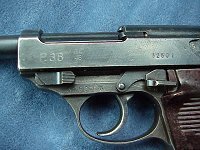 In June, 1940 the Army issued orders to the Mauser, Obendorf to cease production of the P08 Luger, and begin to produce the P38. The leadership at the Mauser plant was not in favor of this change, and the production of the P08 Luger continued up until 1942. Finally in November 1942, the production of the P38 began at Mauser. At the end of December 1942, Mauser delivered its' first 700 pistols with the code byf 42. By the end of the war Mauser produced about 300,000 P38s. The Spreewerke Factory at Berlin-Spandau was the third manufacturer assigned to produce the P38. Production began in September 1941. At the end of June 1942 they delivered 50 pistols for testing, which were rejected. In August they delivered another 300 for testing, and these were finally given the long awaited acceptance proof, (eagle 88). The army now demanded 10,000 pistols per month from Spreewerke, although this amount was never obtained. By the end of the war Spreewerke produced around 285,000 P38s. 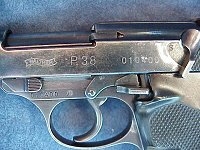 "Zero Series" - As stated earlier, the first production P38s were part of a Zero-series, which have the Walther banner, and serial numbers from 01-013000. Below is pictured an example of the Zero series P38 produced by Walther. Left side view of the Zero series P38. Note rounded lanyard loop, and slot on the grips. Also note "Walther" banner on side. Zero series P38 Right side view. Note the checkered grips, high-polished finish. Close up of the left side of the zero series. Note the Zero series serial number. These will be numbered from 01-013000. Every part on the zero series will be proof marked with the "eagle 359" marking. Even the grips will be serial numbered to match the gun! as well as proof marked. Be sure to check this all out! The serial number will be marked on the left side of the magazine, and should match the gun. These two do not match, but are both original zero series magazine. The one on the left has had the serial number scratched out. Most likely done by the Russians who captured it. Note that no model designation will be on these, like later magazine have! The Zero series holster. Most P38 hard shell holster will follow this pattern (but not all!). The zero series P38 will belong in either a 1939, 1940, or early undated WaA holster (as this one is!). All of these should be military proof marked! The reverse of the zero series holster. Note that there is no model designation on this. Also this particular one has no date. However it is military proof marked with a "eagle over WaA number". 480/AC- After the Zero series Walther was assigned the maker code of "480", and the Walther banner was removed, and this number code put in its' place. Approx. 7,000 pieces were made with this code. Later this year the "480" code was changed to "AC" The serial numbers of these will be between 7150-9850. Some pistols will even have both the 480 and the "AC", or be marked "480" with the date "40". These are known as the "480" "40" added pistols and will be serial numbers up to 3000. AC40- This became the standard code and year. Serial numbers began at 9999a, and ended with 9999b. AC41- In 1941 The serial numbering started again at 1. Until the end of that year, which ended at 9999j. In this year several changes can be noted. The "AC" stamping on the left trigger guard was omitted. Also the high polished commercial finish was replaced by a matte military finish. Total production this year was around 112,795. 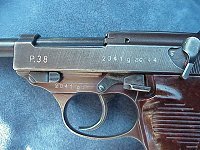 Here is an example of a P38, made by Walther, and marked "AC" over the year "43". This is what is called the "AC43" stack. Later in 1943, the lettering was changed to "AC43" in a line. This shows the wartime red/brown colored grips. Close up showing the "AC43" stack. Finish on the 1943 guns will vary from very fine blue to a dip blue to even rough looking finish. Right side view of the "AC43" stack. Note the red/brown colored grips. These will vary in color from a very bright reddish look to a very dark brown, almost looking black. This shade on this pistol is very nice though, and highly sought after. AC44- Serial numbers start at 1 and went to 9999l. Right side view of a very lovely late war P38, made by Walther. This one is marked AC44. Note the brown/blued finish on this piece. Also note the red/brown grips, and white lettering. This gun would rate 98%. Close up showing us the in line markings of the "AC44" which Walther used after 1943. Note the tool markings showing, and also note the brown/blued finish, which is sometimes found on late war pieces like this. Right side view of the "AC44" P38. Note that some parts are standard blued, while the frame and slide are brown/blued. Note also the mint red/brown colored grips! This is a very late war hard shell holster for the P38. Hard shell holsters were discontinued in 1943, however a few variation patterns of the hard shell were produced and issued. This is a very rare example. Note that the front of this holster is black leather. Inside of this holster there is no lift strap. Instead the holster itself is cut low so that you can pull the P38 out without any problems. The backing inside the holster is made of laminated fiberboard. This is correct! Reverse of the 1944 dated P38 hard shell holster. Note that the back of this holster is brown leather, but the belt loops are black leather. This is correct! The magazine pouch is made of ersatz, (which is laminated vinyl), and looks shiny. This is correct. 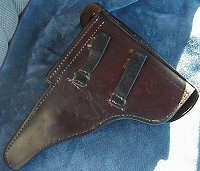 Reverse of 1944 hard shell P38 holster. Note the maker mark, "A. Fischer, Berlin C.2, 1944", and the model designation "P38". This holster is maker marked, and note maker coded. Also note that this holster has no Police, or military proof markings. This is a commercial marked 1944 P38 hard shell holster! Extremely rare, since I don't believe they were selling commercial holsters in 1944. I can't over emphasize how rare this holster is, so be extremely careful if you see one for sale! Caveat Emptor!! Another AC 44 Marked P-38, right side. AC45- Serial numbers start at 1, but no continuous numbering occurred this year, and I'm not sure what was the last serial number produced. Total production was around 40,000 this year. Byf42- Only about 700 of these pistols were produced, and they are quite rare. Byf43- No major changes. Serial numbers not known. A beautiful example of a mid war produced P38 made by Mauser. Right side view shows us the black wartime grips, and a lovely finish that is about 99% intact. 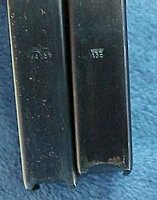 Two magazines for a Mauser produced P38 will either be marked "eagle 135" or "eagle over WaA135"
The left side of the frame on this Mauser produced P38 shows us the "eagle 135" proof mark just above the trigger, and also the serial number of the frame. The serial number of the barrel will always be located just under the barrel. The locking block will also have the last 3 digits of the serial number, and in some cases (as shown here) the letter suffix as well. The slide shows us that this gun was made by Mauser in 1943, "byf43" markings, and also the full serial number on the slide. The Mauser proof mark "eagle 135" will also be on the locking block. Test fire proof on the locking block. 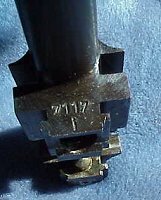 Mauser "eagle 135" proof marking on the barrel. Test fire proof on the barrel as well. 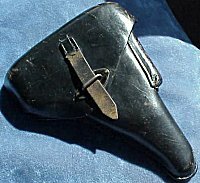 A typical mid war P38 hard shell holster. The hard shell holsters of this type were issued between 1939-1943. In 1944 hard shells were discontinued, but some versions were still issued. By 1943 the break-a-way holsters were being issued instead. If you have a 1943 gun you can put it in either a hard shell like this one, or a break a way holster. 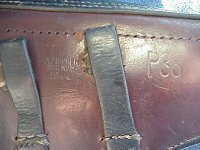 Reverse of the hard-shell holster shows us the model "P38" and also the maker code "gxy" and the date "1943" Below the date is the military proof mark, "eagle over WaA number". The maker code "gxy" is for Klinge, Gebr., Lederwarn-Fabrik, Dresden. Right side view of this beautiful byf43 Mauser produced P38. Note the black colored grips, which are more common, and also the lovely wartime finish. This gun would rate at least 99%. Close up of right side, showing the "byf43" and serial numbers. Note the tool markings, and finish. Byf44- no changes, serial ranges not known. Byf45- very few of these were produced, and later Mauser code was changed to "svw45". 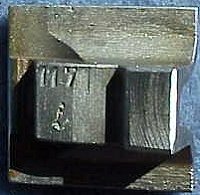 This code can also be seen on several thousand post war French assemble P38s. Cyq- This is the maker code assigned to Spreewerke, no year of manufacture was used on these guns. Cvq- this code is seen on very late war P38s. These were assembled by Jos. Rathgeber, Muchen 54, made of parts by Spreewerke. All of these guns will have a prefix rather than a letter suffix. The prefix will either be a "0", "a", or "b". These guns were produced between January - March 1945. No year will be on these guns as well. Other makers were assigned to make parts for the P38, such as magazines, slides, and grips. Below is a listing of a few known makers of P38 parts. Fabrique Nationale d' Armes (FN)- Manufactured slides which were marked with the code "FN". Most of these slides went to the Walther firm. Ceska Zbrojoka (CZ)- In Brunn, Czechoslovakia, CZ produced locking blocks. These will be marked with the code "fnh". Privni Severoceske- Produced grips, and other parts with code "dov". 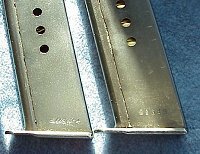 One other Czechoslovakian sheet metal producer made magazines for the P38 which will be marked with the code "jvd" and also WaA706. There were also plans to increase P38 production by adding other makers. These included: J.P. Sauer, Erma, BSW, and Krieghoff. However this never happened.